Dr. Choksi is a Lecturer in the Department of Radiology, Dr. Quint is a Professor of Neuroradiology and MRI, Dr. Maly-Sundgren is an Associate Professor of Neuroradiology, and Dr. Hoeffner is an Assistant Professor of Neuroradiology Department of Radiology, University of Michigan Medical Center, Ann Arbor, MI. Symptomatic cerebral infarction ("stroke") affects more than 750,000 Americans each year and has a mortality of 22%. 1 It is the third leading cause of death in the United States and the annual costs are estimated to be $45 billion. 1 Until the mid 1990s, management of stroke patients usually involved supportive care in the acute period, followed by a diagnostic workup in an attempt to define a cause of the patient's symptoms for which treatment might be instituted with the goal of preventing future events. 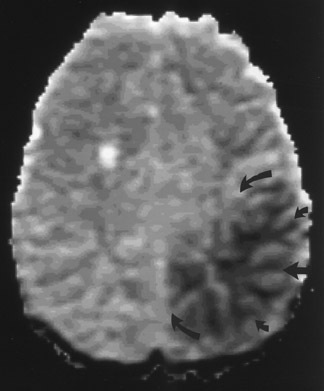 For example, computed tomography (CT) was performed to rule out other pathologic processes that can present with stroke-like symptoms, such as neoplasms, acute extra-axial fluid collections (epidural hematomas, subdural hematomas), infections, or any cause of a seizure (masses, vascular malformation). 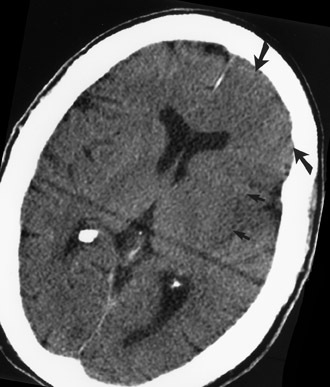 CT was also performed to rule out hemorrhage associated with an area of cerebral infarction that would contraindicate anticoagulation therapy. 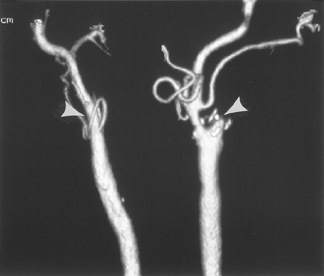 Later, diagnostic workup including cerebral angiography was often performed to identify arterial abnormalities that might be amenable to surgical (eg, endarterectomy) or medical (eg, anti-platelet, anticoagulation) therapy. 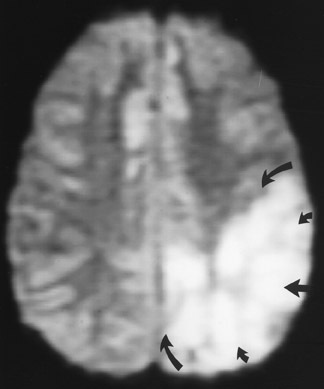 In 1995, the National Institute of Neurologic Disorders Study (NINDS) Group 2 reported that the use of intravenous (IV) recombinant tissue plasminogen activator (t-PA), if administered to patients with ischemic stroke within 3 hours of symptom onset, resulted in an absolute improved outcome (end point: little or no disability 3 months after the event). This work has been confirmed by subsequent studies. The U.S. Food and Drug Administration (FDA) approved the use of IV t-PA for this purpose in 1996. The use of thrombolytic therapy for intra-arterial treatment of anterior circulation thrombi has been shown to be efficacious up to 6 hours after symptom onset 3,4 ; but as of the end of 2004, the FDA had not yet approved its use for this purpose. 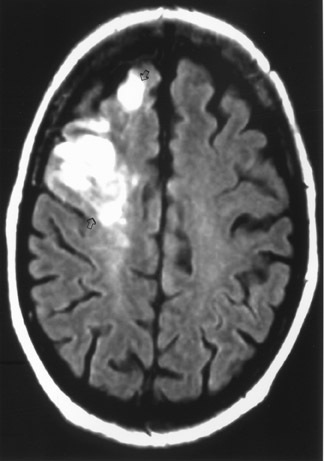 Early imaging has become crucial in the management of these patients. Specifically, acute intracranial hemorrhage and nonvascular causes of stroke symptoms need to be ruled out within 3 hours of symptom onset so that the use of IV t-PA can be considered. 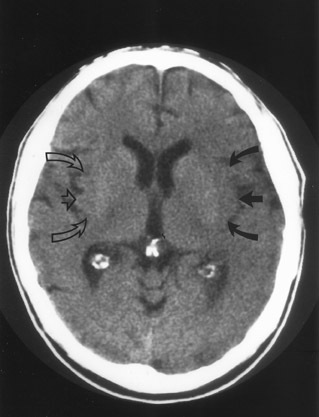 As t-PA is not a benign drug (it is associated with a 10-fold increased risk of causing an intracranial hemorrhage), imaging has become an important tool for identifying which patients may benefit from thrombolytic therapy and which patients may not and, therefore, should not be exposed to the risks of such treatment. Imaging also provides information that could potentially identify subgroups of patients who might benefit most from aggressive therapy beyond the accepted "therapeutic window" of 3 hours. Therefore, it is important for interpreters of imaging studies to be aware of specifically what to search for and report upon on emergent scans. While the NINDS study 2 established that IV t-PA was useful if given to patients with nonhemorrhagic stroke within 3 hours of symptom onset regardless of associated parenchymal ischemic changes, the European Cooperative Acute Stroke Study (ECASS) trial 10 studied patients with stroke symptoms of <6 hours' duration who had CT-demonstrable ischemic changes involving no more than one third of the MCA territory. 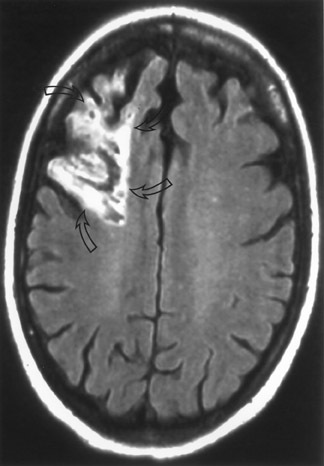 This and subsequent studies revealed that although patients with CT-demonstrable parenchymal changes within the first 3 hours after symptom onset have a relatively worse outcome than patients who present with symptoms but no abnormalities on CT, 5 they may still benefit from IV t-PA administration if the identified parenchymal changes involve less than one third of a vascular territory. 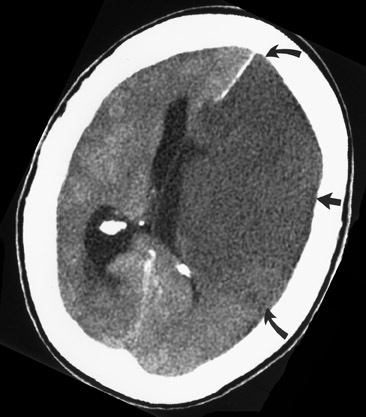 Therefore, when reporting a CT scan for this patient population, pertinent findings to be mentioned include: the presence or absence of hemorrhage, the presence and extent of any ischemic parenchymal changes, and the presence or absence of nonvascular etiologies of stroke-like symptoms. Diffusion-weighted MRI ( d MR) is based on the principle that random Brownian motion of water molecules in tissues can be measured and quantified. Water molecules that are not "restricted" by cell membranes, macromolecules, or other structures will have greater net diffusion over a given period of time than will water molecules surrounded by cell organelles, membranes, large proteins, etc. Therefore, water molecules in the lateral ventricles have "high" (a large amount of) diffusion while water molecules within a cell have more "limited" diffusion. MRI is considered a better test than CT for identifying acute ischemic changes, with d MR being a highly specific test for early detection of usually irreversible parenchymal injury. 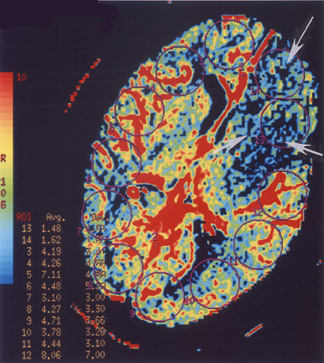 Perfusion imaging, be it perfusion MR ( p MR) or perfusion CT ( p CT), evaluates the characteristics of blood flow to a given region of the brain. It is recognized that brain parenchyma can be hypoperfused without permanent parenchymal injury. Therefore, a brain region with lower than normal perfusion can either be infarcted or be at increased risk to progress to infarction. The concept of "ischemic penumbra" refers to an area of reduced brain parenchymal perfusion with or without associated loss of neuronal function, but with involved neurons remaining viable. 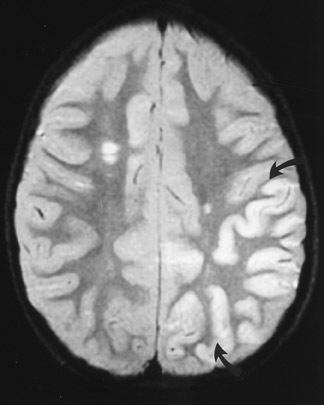 16 This area of the brain is considered "at risk" to go on to irreversible infarction if blood flow is not improved. This area of brain usually separates an area of frank cerebral infarction (presumably irreversible injury) from normal brain. 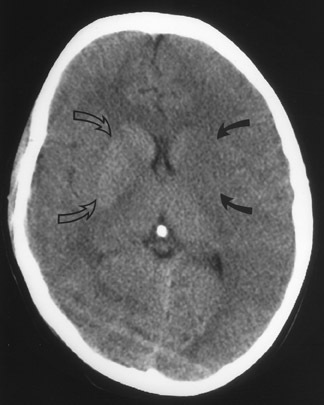 It is this area of the brain that aggressive IV thrombolytic or neurointerventional management targets to protect from further injury. The time period during which brain tissue within the ischemic penumbra remains viable is debated, 17 as the transition of brain tissue from potentially reversible to irreversible injury is dependent on the severity and duration of the underlying ischemic process. 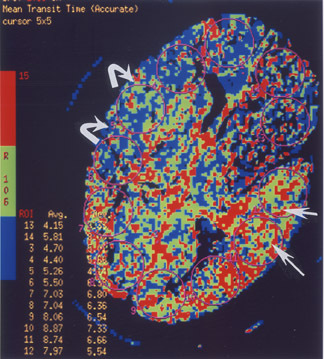 16 As a patient with a significant penumbra territory is likely to benefit from thrombolytic therapy, one of the current goals of imaging is to try to identify this "at risk" brain tissue so that appropriate aggressive therapy can be targeted to this region. Similarly, if imaging can indicate that there is little or no penumbral territory, those patients should probably not be exposed to the risks of aggressive therapy, because there may be little viable brain to salvage. Perfusion CT is performed in a manner similar to p MR. 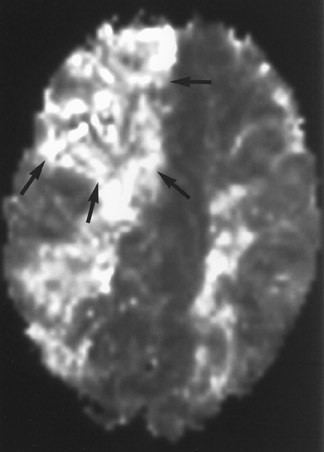 Serial CT scans are acquired rapidly to dynamically track a bolus of IV contrast material as it travels through the brain 24 at a single location (ie, the basal ganglia region in the case of suspected MCA stroke) or at several contiguous locations (but covering no more than a 2-cm-thick slab of the brain). Again, hemodynamic maps of brain perfusion can be generated as this contrast bolus passes through the brain. 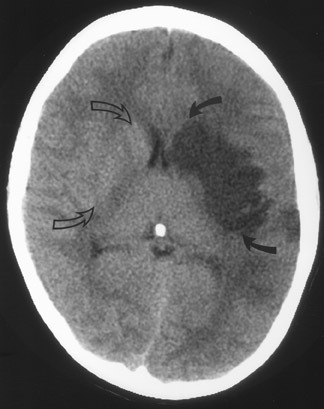 Different parameters, including time-to-peak (TTP; the time that elapses between the start of an IV contrast injection and the maximal attenuation of contrast-enhanced blood as it passes through a defined region of the brain), MTT (which can be oversimplified to be considered the time it takes blood to flow from a major cerebral artery feeding a given region of the brain to the major cerebral vein draining that region), CBV (the volume of blood in a defined portion of the brain at any given time), and CBF (cerebral blood volume/min) can be measured or calculated. While there is debate about the significance and reliability of these parameters, some researchers 24,25 believe that CBF (or MTT) on p CT is similar to a perfusion abnormality on p MR, while CBV on p CT is similar to a diffusion abnormality on p MR, so that a CBF/CBV (or MTT/CBV) "mismatch" on perfusion CT (Figure 6) is similar to a perfusion/diffusion "mismatch" on MR (Figure 5) and may have the same implications with respect to identifying the presence or absence of an ischemic penumbra and the potential usefulness of aggressive neurointerventional therapy in any given patient. CT angiography (CTA) is best performed on a late-generation multislice CT scanner on which a fast thin-section volumetric spiral examination is performed during a time-optimized bolus of IV contrast material injection with opacification of blood vessels. 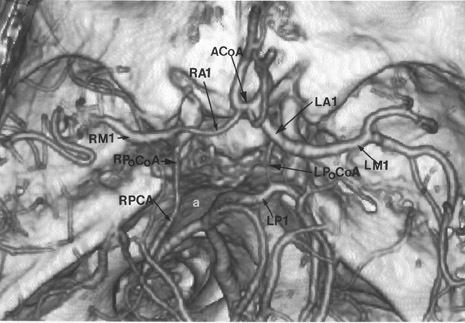 9,26 Complete imaging of the craniocervical circulation from the aortic arch through the circle of Willis region can be performed in as little as 20 seconds. High-resolution two-dimensional (2D) (multiplanar reformatted [MPR]) or three-dimensional (3D) reconstructed images presented as maximum intensity projection (MIP) or shaded surface display (SSD) images (Figure 7) can be obtained. 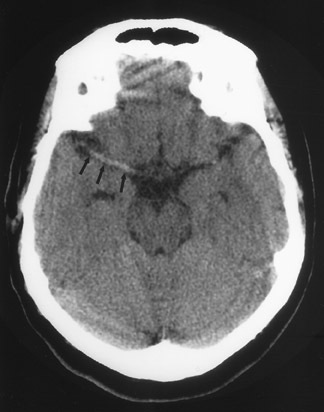 CT angiography can be performed at the same time that a dedicated cranial CT examination is performed, as CTA requires relatively little patient cooperation, is a quick examination, and can identify sites of intracranial or extracranial vessel stenosis or occlusion as possible underlying causes of a patient's acute symptoms. It can, therefore, potentially identify the source of an ischemic process to aid in the planning of (sometimes emergent) definitive therapy. 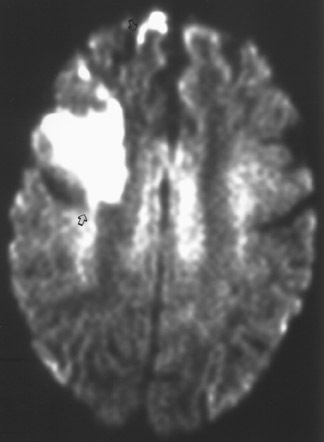 The current role of imaging in patients with acute onset of stroke-like symptoms not only includes ruling out nonvascular causes of stroke-like symptoms, excluding intracranial hemorrhage, and defining the extent of an acute ischemic process, but also differentiating between the infarcted core and the ischemic penumbra of an area of acute ischemic change and, if possible, to identify the cause of an acute ischemic process. Standard CT and MR scanning, diffusion/perfusion MR, perfusion CT, and CTA (and possibly MRA) each has a potential role in defining an abnormality and determining appropriate emergent management in these patients. In the future, it is hoped that some combination of these imaging techniques, and possibly others (eg, MR spectroscopy, MR tensor imaging), will help identify potentially salvageable brain tissue beyond the currently accepted short (3- to 6-hour) window. Imaging of acute stroke. Appl Radiol.